Under the new VA rules, Veterans are faced with a new set of challenges when attempting to qualify for or even retain their VA Pension benefits. During this comprehensive course, we discuss planning strategies available under the new VA rules, including how to determine when half-a-loaf planning is appropriate, and when proactive planning should be done. We also cover how the VA is treating irrevocable trusts, as well as tips on drafting effective irrevocable trusts for VA pension purposes. 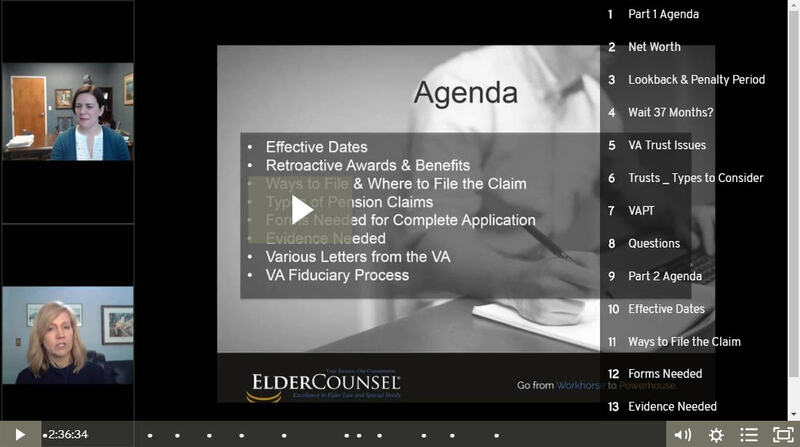 The second part of the course is focused on what you need to know to file a claim for VA Pension or VA Survivors Pension benefits using the Fully Developed Claim process. We include tips and tricks you need to be aware of before the application is filed, development letters you might receive, and having a VA Fiduciary appointed after the claim is approved.